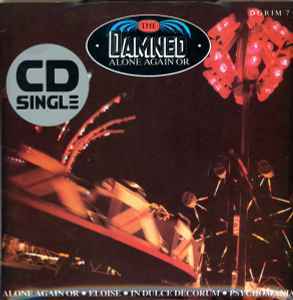 Taken From The Damned Album "Anything - LP:MCG 6015, Cassette:MCGC 6015, CD:DMCG 6015"
CD is housed in a black plastic "transport tray" in a 7" cardboard sleeve, including an insert with instructions on how to remove the CD from the tray. 1: Southern Music Publishing Co. Ltd.
3, 4: Rock Music Co. Ltd.
© 1987 MCA Records Ltd. Tracks 1 & 2 ℗ 1986 Tracks 3 & 4 ℗ 1987 MCA Records Ltd.